Almost 4 years after passing out blank quilt squares to family and friends, my daughter’s “baby” quilt is finally finished. 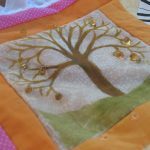 Before the birth of my first daughter, I decided that I wanted her to have a community quilt. I wanted her to have a tangible reminder of people who were close in her life at the time of her birth. As a quilt and fiber arts lover, what could be more perfect than a quilt square from each of these people? Each square touched by the hand of each maker, a little snippet of each personality. Each square a place in time. As the squares poured in, I treasured each one. 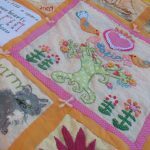 Some were hand stitched, embroidered and embellished. Some were hand painted or beaded. This format even lent itself to the non-crafters. With the purpose of creating something personal for a new baby, each person was pulled to creating a little work of art. Creating something so meaningful and lasting touches even the souls of those of us who think we are too busy to sit down and make something by hand. 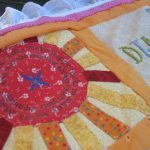 This project brought out the best in everyone and encouraged them to stop and make something, the only way a quilt square can be made, slowly. After everyone else did their part, I had to actually sit down and put the thing together. Ok, ok…with the help of my Mom. It did come together, kids playing in the background, piece by piece, hand-sewn together. 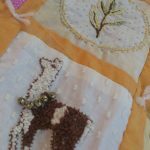 I loved every minute of getting my hands on this quilt, knowing how much love had touched this fabric, then to pass this onto my daughter to forever cherish.